St. Barnabas Episcopal Church is attempting to bolster its youth participation. And it has hired an unlikely figure to catalyze this effort. 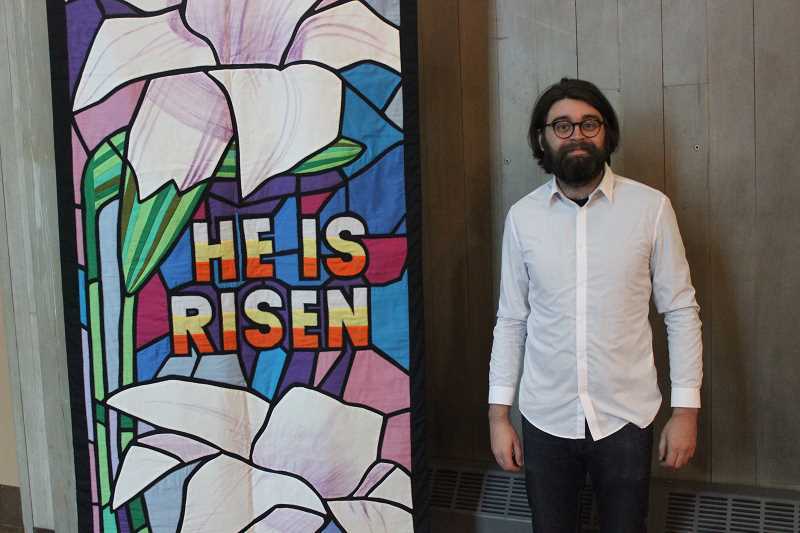 After years as a professor and dispassionate observer of religion, Aubin Spice has opted for a more participatory religious experience — earning the role as the church's youth minister and Christian education director. "I need to be there professionally but I also need to be there personally and that's different than advising students how to write papers and how to think about topics abstractly," Spice said. "I do that here as well but I do it for people I'm getting to know and people I see every day or week." Lead by Spice, St. Barnabas, 2201 S.W. Vermont St., is jumpstarting a vacation bible school and developing teen programs to involve the youth in the church beyond Sunday school. The church received a grant from the Episcopal Bishop of Oregon Foundation to fund Spice's position. "There were no youth programs here at all I think throughout the entire congregation history. Suddenly they realized, the time is now," Spice said. "You're either going to have more than a Sunday school or give up on the future." Spice has always been interested in religion but says his path toward becoming a youth minister was unexpected. Growing up in a Catholic family that didn't attend church but placed him in a baptist school, Spice maintained an interested but dispassionate perspective toward religion. "I didn't belong to religion but it was interesting because I was always right on the outside, always looking in," Spice said. And Spice went on to study the philosophies, history and practices of religion in college including studying abroad at Oxford University. Later, he became a professor and taught religious studies at a Chicago community college. In the job, he lacked personal connection. "You have to speak with an authoritative voice. And then you give people exams. And then you have to grade them. It's a cold process," Spice said. And he came to question his place on the periphery of religious experience. "It's silly just to sit at the doorstep," Spice said. Realizing he desired a more immersive religious experience, Spice got baptized last year. He also moved from Portland to Chicago with his girlfriend, who is a native born Oregonian, and sought a job and a community. "When I decided to enter the church over a year ago, it was in part because I lacked a community, any kind of community," he said. "It's not always easy to be part of a community and it can be challenging but that challenge is always worth it. I'm now working hard to make sure people have a community, a strong one." And he says the episcopal church complemented his cerebral sensibilities. "Some churches definitely are dedicated to getting a feeling out of people," Spice said. "That's not to say that feelings don't happen here but feelings go alongside thoughts in most episcopal understandings." St. Barnabas didn't have any youth programs other than Sunday school. Now, they are jumpstarting a Vacation Bible School camp — a weeklong program in which children between the ages of 5 and 11 play sports, work on arts and crafts and tinker with science projects. Spice is also working to develop a high school group where teenagers can congregate for a movie night or a game night, discuss the Bible or articles and talk about their faith. He expects the program to begin in May or June. "It's just a matter of getting the kids to know that they can have good and safe fun at the church," he said. "Generally when it comes to middle school and high school programming, moral development is not just supplementary. It's key." Spice is also working to partner with the Portland Rescue Mission so that the church consistently serves meals to homeless people. And he believes the church's youth would benefit from playing a role in this effort. 'They're (kids) connected more than ever but they also feel alone I think in a way that has never been so exacerbated before," Spice said. "I think if you can involve kids in charity, they are already on the first step to feeling good about themselves and their community." Becoming personally involved with the church has been an adjustment for Spice. But it's given him a greater sense of purpose. "I would say it's far more fulfilling so far to be working with kids for their own sake and without judgement," he said.